Rotary evaporator plays an important role in the laboratory. It is composed of motors, distillation bottles, heating pots, condensing pipes and other main components.Besides, it is also widely used in some fields, such as chemistry, chemical engineering, biology, medicine and so on.By means of electronic control, the flask can be rotated at a constant temperature speed to increase its evaporation area. Because the role of rotary evaporator is very important, today I would like to introduce the four steps in the use of rotary evaporator. 1.Adjust the height of the rotary evaporator.The rotary evaporator can be manually raised or lowered.When in use, the knob should be controlled:If you turn the knob, the rotary evaporator will rise; if it rotates in the opposite direction, the evaporator will drop.The rotary evaporator can be electrically raised or lowered. If you press the up button, the main unit will rise; if you press the down button, the main unit will drop. 2.The condenser is provided with two external interfaces, which are used to connect condensed water.One external interface is for water to flow in and the other is for water to flow out. However, it should be noted that the lower the temperature of condensed water, the better the condensation effect. At the same time, the upper interface also has a vacuum connection device for maintaining the vacuum state. 3.Before starting the rotary evaporator, turn the knob to the minimum value, then press the power button and turn the switch light on.Then Turn the switch on the right side slowly to the desired temperature.In general, the larger evaporator speed is maintained at a medium or low speed, while the higher viscosity of the liquid solvent is maintained at a high speed. The standard interface model of the flask is No. 24, and there are two kinds of bottling, namely 500ml and 1000ml. In the process of use, you can choose according to your own requirements. In general, the amount of solution shall not exceed 50%. 4.When using a rotary evaporator, first,you need to release the pressure and then turn on the motor and evaporation flask.When the trial ends,first turn off the motor to prevent the distillation bottle from falling off during the rotation. These above are the four steps for using a rotary evaporator. 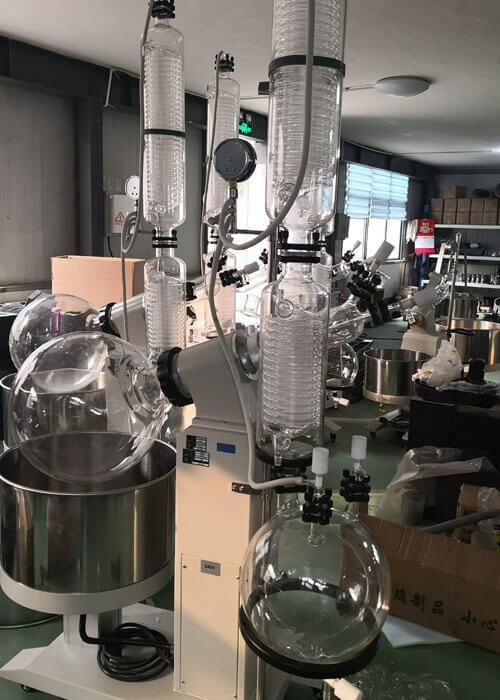 you should pay special attention to these four steps in the process of use.Of course, the rotary evaporator should also consider several details during use: glassware, including rotary evaporators, should be carefully inspected and cleaned before use. A layer of vacuum grease should be applied to the sealing surfaces and connections prior to installation. All of the above are matters needing attention. If you want to know more, please call: 0371-67447999.